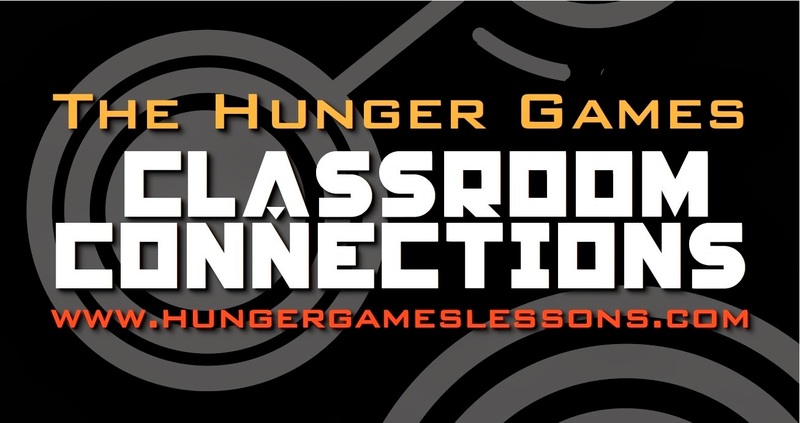 How do you introduce The Hunger Games to your students? Do you jump right in and start reading? Do any activities prior? Research the author? Read about Greek mythology or Roman gladiators? All of those activities are good openers for Suzanne Collins' The Hunger Games. But I like to start with a short story by Shirley Jackson called "The Lottery." "The Lottery" is set in present time, which makes its story all the more chilling. 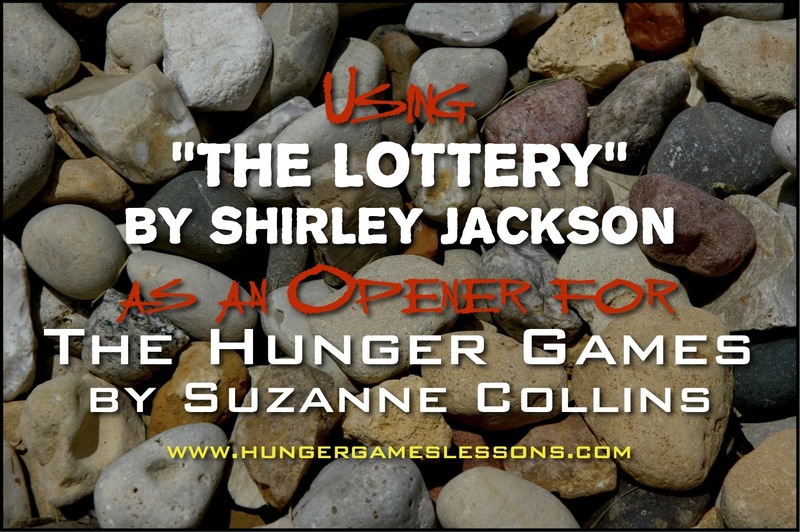 Without giving anything away, "The Lottery" serves as a good comparison to the reaping in The Hunger Games. Both happen on or near the summer solstice and both events are annual rituals steeped in tradition and serving a purpose. 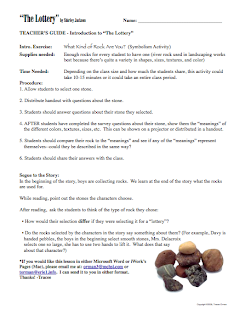 To begin, I bring in a container of river rocks and have students choose one without telling them why. (I use river rocks because of their variety in size and color. You can find them in the landscaping section of your local hardware or garden shop. Or if you live close to a river, collect them yourself.) After each student chooses a rock I have them describe the rock and why they picked that particular one. I show them a chart with the "symbolism" of the shape, color, and texture of their rocks and they se if it matches with their personality. It's amazing how many actually do. Is the "symbolism" a little hokey...sure it is (like reading horoscopes). But it's fun and the students like it; and because I love irony, it helps throw the students off a little when we get into the story. I point out in the end to look back at the rocks the different characters chose and what that means in the context of the story. I think the lottery in the story is a great comparison to the reaping. I have a compare/contrast writing prompt I give my students after we've read chapter 3 in The Hunger Games. Later in the novel we refer back to different concepts from the story, as well. In fact, I used it to introduce Catching Fire one year with one group and Mockingjay with another. Both novels work well with the whole concept of sacrifice and in Mockingjay, in particular, we discuss the the age of those who are fighting for their country or for the betterment of humankind. It opens up the discussion about drafting during wartime (even though this generation of students haven't lived through a draft, the boys are still required to register in the selective service when they turn 18). Thanks for sharing. A teacher that I had worked with years ago used this and I forgot all about it. Thanks for the reminder. 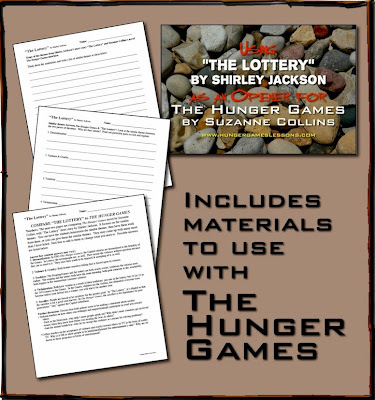 I am in the midst of Hunger Games with my students and think this would be great for my highest kiddos. Pin-Worthy...My Favorite Pins This Week!